As a child of the 80’s I grew up on Transformers. As a mobile strategy fanatic I’ve been in love with turn-based strategy games for years. It should come as no surprise then that Transformers G1 Awakening ranked pretty high on my most wanted list. But it also ranked fairly high on my list of concerns. After all – Transformers has had countless reinventions over the last few decades, none of which could hold a torch to the series that started it all. Likewise the series has had a number of video game spinoffs, nearly all of which have managed to disappoint. Could a Transformers game released more than 25 years after the series inception possibly live up to the expectations of series purists and strategy fans alike? As mobile gamers first learned in 2008, the answer is a resounding yes. 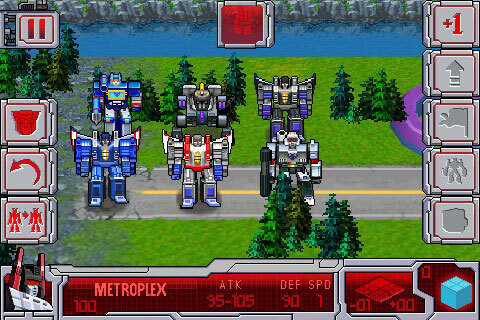 Originally available for mobile phones back in 2008, Transformers G1 Awakening is a solid strategy game that takes fan service to a whole new level. If you grew up on the original Transformers cartoon from 1984, you’re going to squeal like a 6 year old when you see some of the choices the game has made. 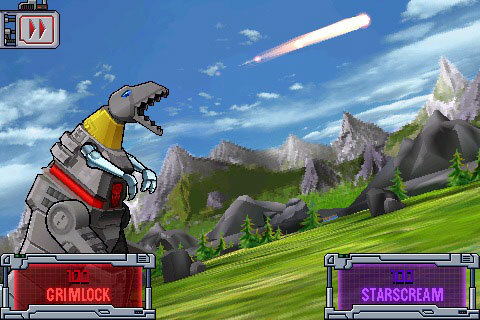 The cast is comprised of series mainstays like Optimus Prime and Bumblebee, but the game happily makes room for fan favourites like Grimlock and Ironhide. True to the television storyline, the story starts with the crash of the Ark and continues through to the Space Bridge built by the Decepticons. Jetfire’s first appearance is even true to his back story, starting out with the bad guys and quickly switching sides. Gameplay here should be familiar to anyone who’s played turn-based strategy games like Rogue Planet or UniWar. Each unit will be able to move a certain number of squares, attack opposing forces, and capture important structures. Unique to Transformers however, is the ability to -– well -– transform. Every character can transform from robot mode to vehicle mode and back again. Vehicle mode offers a major advantage if you need to cover ground as you’ll be able to move around with much greater ease, but it also comes with a major disadvantage as you won’t be able to defend yourself from attacks. Unlike many of the games that G1 Awakening draws inspiration from, the gameplay emphasizes strategy over sheer force. Certain levels play out more like puzzles than tactical combat situations. By offering up actual characters instead of generic unit types, you can never have more than one of a certain unit on screen at the same time. Like the morale boost Optimus gives his troops, but also enjoy his high attack rating? He can’t be in two places at once, so you’ll need to place him where he’s needed the most. Some of the characters will share similar stats and abilities, but no two Autobots play exactly alike. Prowl and Sideswipe both utilize ranged attacks, but their distance and power are different. Ironhide had a great chance to deflect damage, but his mobility is severely limited. It’s very rare that you’ll ever have more than 4 or 5 characters on screen in any given level, so knowing the strengths and weaknesses of every character (including those of the Decepticons you’re trying to destroy) is essential to your success. Having a limited number of characters doesn’t mean you can’t introduce more into the battlefield, it just means you’ll need to be selective on who you introduce. New units can be purchased by spending Energon, which you’ll earn on each turn. The amount you earn depends on the number of pylons or power stations you’ve captured. As strange as it may sound, unit production became one of my favourite parts of the G1 Awakening – not for any gameplay reasons, but because it’s a shining example of the crazy amount of fan love that went into the game design. Units aren’t created in a factory or rolled off the back of a truck – they’re introduced into the battlefield by Metroplex, the Autobots living battle station. The only thing that could have been better is if Blaster was able to produce units like Eject and Rewind, and guess what? He can do that too. If anyone tries to tell you that G1 Awakening isn’t everything an old school Transformers fan has been waiting for, you just tell them to shut their lying mouth. G1’s campaign is 17 missions long and should take the average gamer 3 or 4 hours to work through – not a bad package, but not necessarily as long as similar turn-based strategy games on the App Store. In addition to the story mode G1 Awakening also offers Showdown mode, a series of challenges that pit the Autobots against the Decepticons in a number of unique situations. Rounding out the package is Cybertron Arena, G1’s fancy name for multiplayer. Cybertron Arena earns serious points for finally letting us play as the Decepticons, but it loses just as many for its limited gameplay options. You can’t play online, you can’t play over local wifi -– the only option for multiplayer is single device pass’n’play. It’s a good fit for this style of game, but on its own it just feels like too slim an offering. Still, if you don’t have another friend to play with sitting next to you G1 Awakening at least offers up a Cybertron Arena AI option. Outside of the slim multiplayer options, the only real disappointment here came from the visuals. The game was ported from a 2008 mobile phone release and when you’re issuing commands on the map it really shows. It’s not just that the graphics are ripped from a mobile phone, it’s that the design decisions made for the mobile phone version just made no sense. Each character has a constant animation when standing still that has their torso and arms moving in a way that mimics breathing (which, I’m pretty sure robots don’t do), so we know they can do animations. Yet when characters move around the map in robot mode their feet don’t move. It’s like moving asthmatic chess pieces. The terrible command mode visuals are a stark contrast to the battle visuals which easily rank amongst the best in the genre. Cel-shaded graphics come to life in a quick battle animation that looks like it could have been ripped right out of the series. If anything, they reminded me a lot of the visuals in 2002’s Robotech: Battlecry for home consoles. If you’re not familiar with the game, trust me, that’s a compliment. As a strategy game, Transformers G1 Awakening offers up enough twists to help it stand out in a sea of similar games. As a Transformers game, it offers up anything and everything an old school Transformers fan could want to see. 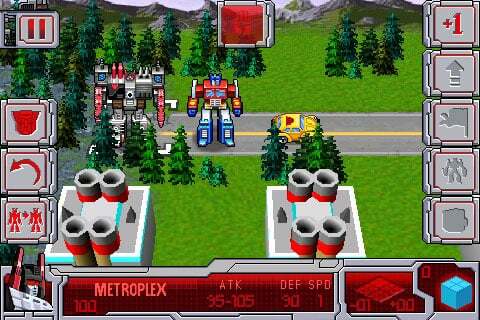 G1 Awakening isn’t simply a great strategy game, it’s the greatest Transformers game I’ve seen to date.